Cowes is fortunate to enjoy the benefits of its geography and history. Its position at the centre of the Solent, with a harbour that is easily accessible and a river navigable as far as Newport, has made it the Isle of Wight's main port as well as a popular destination harbour and event centre for sailing and powerboating. Cowes' history is steeped in yachting tradition. Even before the 1815 founding in London of The Yacht Club, which went on to become the Royal Yacht Squadron, Cowes was a fashionable watering place. The Cowes Regatta, which was based on the annual licensing of the local pilot vessels and races between them, was a popular spectator sport for visitors even before the advent of Cowes Week. When Queen Victoria's court was at Osborne House the town became famous for yachting and social events. Today, Cowes has evolved to meet the demands of a growing leisure marine audience and tourist visitors. The harbour and river offer easy access and a choice of mooring types, either close to the town or in the more tranquil stretches of the River Medina. In addition to leisure craft the harbour and river see a large number of commercial movements including Red Funnel car ferries, high-speed Red Jet ferries, and cargo vessels up to 100m. The approach to Cowes is fairly straightforward by day or night but caution is always advised especially at or near Springs when strong tides run across Cowes Roads which can easily set you off course. Hazards include the numerous mooring buoys to the east of Cowes entrance and areas of foul ground and drying banks to the west (rocks); you need to constantly monitor your position. The Red Jet ferries often approach and depart the No. 1 and 2 fairway buoys at high speed and the Red Funnel car ferries should not be obstructed; rule 9 applies in the fairway which extends approximately 500m to the north of the No. 1 and No. 2 buoys. Small craft may opt to use the small craft channel that connects the eastern approaches to Cowes with the main fairway opposite Town Quay, enabling small vessels to avoid the main harbour entrance when approaching/departing Cowes from/to the north and east. The depth in the small craft channel may be as little 0.2m below chart datum. As a rule of thumb, if your draught is more than the current tide height you should avoid using the channel. 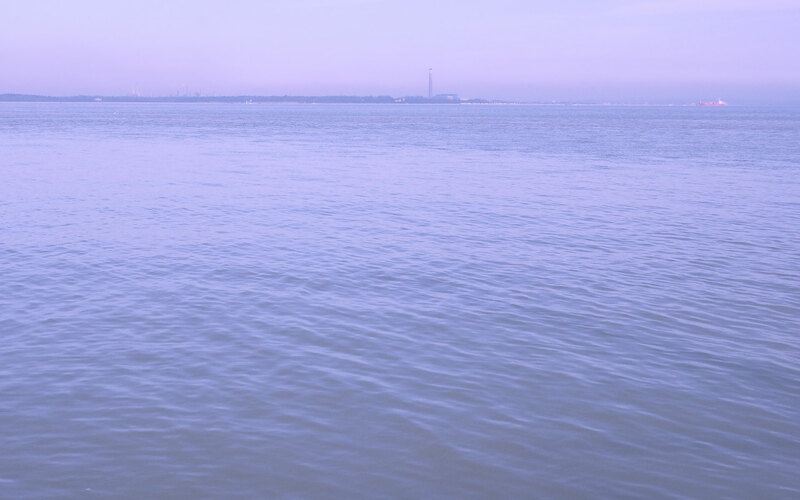 The current tide height can be found on the cowes.co.uk home page or on the tide boards located at Town Quay and the Shrape Beacon. Vessels using the channel should stay below 6 knots and pass to seaward of the Shrape Beacon and between the three pairs of red and green buoys and also the two pairs of yellow marks. The best approach is from the north cardinal buoy Prince Consort, approximately 4 cables due north of the entrance and keeping close to the starboard-hand marker No.1, following the starboard side of the channel. Once past No. 4 port-hand buoy the cross tide is considerably reduced and the entrance is easier. At LW Springs it is important to monitor your depth and stay well within the channel as there are drying heights at chart datum on the eastern side. There is a 6 knot through the water speed limit within Cowes Harbour. All vessels shall have their engines ready for immediate use when sailing south of No 4 buoy. The Town Quay basin and surrounding area are often busy and vessels must keep watch for Red Funnel car ferry and Red Jet catamaran movements. The Cowes Chain Ferry, or 'Floating Bridge' as it is also known, operates throughout the year for around 18 hours each day and takes passengers and vehicles across the narrow mouth of the River Medina estuary between Cowes and East Cowes. Depending on the tide and position of the Chain Ferry in the river, the depth of navigable water above the level of the chains does vary, being deepest in the centre of the fairway and steadily decreasing towards the banks of the River Medina and at the bow of the ferry. With the Chain Ferry berthed on either the Cowes or East Cowes side, the depth of navigable water above the chains is a minimum of 1.7m below chart datum in the centre of the fairway. Beware of strong tides in the vicinity of the Chain Ferry, especially to the east of the fairway over Spring tides during the ebb when the tidal rate can be over 4 knots. For further information contact the Ferry Manager on 01983 293041. Cowes owes much of its popularity to its location in the centre of the Solent and its position midway between Weymouth (46 nautical miles) and Brighton (53 nautical miles), in the centre of the most popular sailing area in the country. 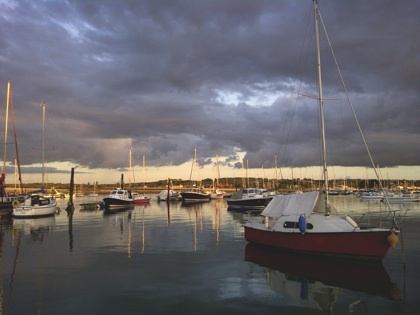 As a result, during the summer season there are lots of recreational craft moored on buoys, pontoons, and pile moorings within Cowes Harbour and along the River Medina. 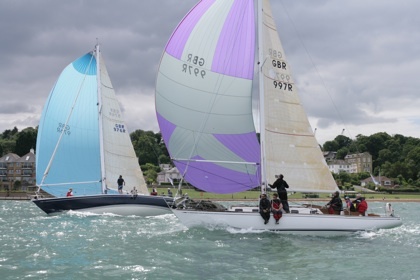 A large number of yacht races start and/or finish in Cowes, and the harbour is also popular with visiting cruisers and powerboaters. The main sailing season runs from April to October with the busiest period during July and August. Cowes Week, which is held in the first half of August, sees the approaches to Cowes Harbour and the fairway become extremely crowded. To contact the afloat Cowes Harbour Master call on VHF Ch 69 Call Sign ‘HM1' or 'Cowes Harbour Radio’ for the Harbour Master's Office. Contact: Harbour Office, Town Quay, Cowes, PO31 7AS. Tel: 01983 293952. www.cowesharbourcommission.co.uk. Scrubbing berths can be found at Town Quay next to the Harbour Office, or an efficient cleaning service is available at Sealift on the eastern banks of the River Medina. Petrol and red diesel are available from Lallow's Boatyard (50m south of Cowes Yacht Haven on the western side of the fairway) as well as at Cowes Harbour Fuels which also supplies Calor gas and oils and is suitable for deep draught vessels. Fresh water is available at Trinity Landing and Town Quay, Whitegates walk ashore pontoon and Thetis pontoon (both in West Cowes). There are several public landing places and slipways. In Cowes there is the Whitegates pontoon suitable for tenders, a slipway between Thetis Wharf and Shepards Wharf Marina, Town Quay adjacent to the Red Jet terminal, the Sun Slip by HSBC Bank, the Market Slip by the Waterside Pub, the Watch House slip next to the old HM Customs, the south end of Trinity Landing, and at Egypt Point there is a slipway east of the Point. Also in East Cowes at the Medina slipway just north of Cowes waterfront hangar, the White Hart slip south of the Red Funnel ferry terminal, the pontoon south of Trinity Wharf, and The Folly slip. Vessels up to 7m LOA can moor at Town Quay, next to the Red Jet ferry terminal from where there is direct access to the High Street. The pontoon at Trinity Landing also offers walk ashore access. Whitegates visitor pontoons are situated on both sides of the main fairway, south of the Chain Ferry. In addition, from March to October M Row, off The Green, provides heavy duty deep water moorings, max LOA 25m. Cowes Yacht Haven is a world-class marina located in the heart of Cowes, giving visitors instant access to a high street full of pubs, restaurants and shops.The marina is accessible at all states of the tide and has 260 fully serviced berths, max LOA 50m. There is a 50 ton hoist, 25 ton boat mover and a 15 ton mobile crane, WiFi, winter berthing, dry sailing,on-site engineers, electricians and boat repairers, laundry, showers and toilets. Cowes Yacht Haven Events Centre is an ideal location that hosts a wide range of events, with room to seat up to 400 guests and 3000sq/m of outdoor exhibition space. Call VHF 80 ‘Cowes Yacht Haven’ for berthing instructions. Contact: Cowes Yacht Haven, Vectis Yard, High Street, Cowes PO31 7BD. Tel: 01983 299975. www.cowesyachthaven.com. Cowes Yacht Haven is a member of TransEurope Marinas. Shepards is one of Cowes Harbour’s main marina facilities offering a full range of services and amenities suitable for yacht racing events, rallies, and catering also to the cruising sailor and powerboater. The family-friendly marina has capacity for 130 visiting boats, 40 resident berth holders, and specialises in providing dry sailing packages for day class yachts, RIBs, motorboats and trailered keelboats. The Sugar Store Events Centre at the Marina benefits from a prime waterfront location. The venue offers contemporary facilities for up to 400 people, with a bar and stage, and regatta/media facilities. Services include boat lifting, dry sailing, electricity and water, free WIFI, inclusive showers and toilets, a free pump out and waste facilities,CCTV, a restaurant, sail maker, annual moorings, as well as visitor and winter berths. Berths can be booked in advance; at peak times in season rafting up may be necessary. VHF Ch 80 Call Sign ‘Cowes Harbour Shepards Marina’. East Cowes Marina is situated in a sheltered location on the eastern bank of the Medina River, just upstream of the Chain Ferry linking Cowes with East Cowes. VHF 80 Call Sign 'East Cowes Marina'. The marina provides 240 annual berths and over 140 visitors’ berths. Visitor berths can be booked in advance, and are all ‘walk-ashore’ with free electricity and fresh water. Shore side facilities include high quality washrooms and showers, a laundry room, car parking, and yacht stores. Free Wi-Fi and internet stations are available in the marina reception. Next to the marina office the ever-popular ‘Lifeboat’ pub with its sunny decking area overlooking the river, serves quality food all day, every day. The marina is a great base for all the Isle of Wight's major events, including the Round the Island Race, Cowes Week, and the music festivals. East Cowes town has a Waitrose and Co-op, a post office, cash machine, restaurants, cafés and takeaways. There are lovely Medina river walks, and Osborne House and the Classic Boat Museum are just a few minutes stroll away. Cowes is easily accessible by Chain Ferry or the friendly and efficient Sally Water Taxi service operating from the marina. The marina welcomes rallies and a marquee and BBQ area are available for hire. If you wish to travel from East Cowes or Cowes to the Folly Inn, the Folly Waterbus is available on VHF Ch 77 or tel. 07974 864627. There are three visitor pontoons up the Medina River near the Folly Inn, one is a walk ashore and the other two are in mid-river. All are run by the Folly Berthing Master. The walk ashore pontoon has water and electricity, showers and toilets are accessible 24 hours a day at the Folly Inn. There is also a scrubbing berth available nearby. Call on VHF Ch 72 Call Sign 'Folly Launch' as you are passing port hand marker No. 10 for berthing instructions. Set in one of the most picturesque riverside locations, in an area of outstanding natural beauty, Island Harbour is situated just over a mile south of East Cowes. This peaceful friendly countryside marina is ideally suited to families with children and dogs. There are over 200 walk-ashore finger berths, as well as many amenities including a fully refurbished restaurant, with a superb children’s play area. There are also showers, a laundry room, car parking, free WiFi, a well stocked chandlery, winter hard standing, on site boat repairers, a 50 ton travel hoist and slipway. Call Sign ‘Island Harbour’ on VHF CH80. Notify the Marina of your arrival when entering the Folly Reach. To enter Island Harbour,continue up the main channel until you reach the five red lane markers, then make your turn as directed by the duty Lock Keeper. There is a ‘waiting pontoon’ opposite the lane markers which can be used free of charge if visiting the restaurant or chandlery. Access is approximately 4 hours either side of HW depending on your draft, although there is a 2.5 metre draught restriction into the marina over the lock gates’ sill. Marina staff are always on hand to help you through the lock, as well as to assist you onto your berth in inclement weather. Contact: Island Harbour, Mill Lane, Binfield, Newport, PO30 2LA. Tel: 01983 539994. www.island-harbour.co.uk. Newport Harbour is a small leisure harbour situated at the navigable head of the River Medina, some 5 miles south from the port of Cowes. Newport harbour is a 5 minute walk to the centre of Newport. There are a broad range of facilities and activities, including swimming pool, leisure centre, community theatre, cinema, hotel, supermarkets and pubs and restaurants available nearby. Furthermore due to its central location it makes an ideal destination to explore the Island by cycle and footpaths. The harbour is also within walking distance of readily available buses that service the whole Island. The visitor pontoons are walk ashore, additionally there is a quay walls for fin keel vessels. At both of these locations, there is power and water available. Throughout the year the quay is used by for many events these include Food markets, car shows, festivals and various marine events. To reach Newport Harbour from Cowes, a beacon at the Folly displays a rapid flashing green light. This is located 1.5 cables south of the Folly Inn Point at the end of the row of yacht moorings. Moving south, two pairs of fixed green lights are located on the west bank, at the northern and southern ends of the Cement Mills site. At Dodnor, a further pair of fixed green lights mark the end of a small jetty extending from the west bank. Shallow points upstream are marked by red buoys on the port side and green buoys on the starboard. On the east bank, the approach to Newport Harbour is identified by large white beacons with pairs of horizontal red lights showing at night. When lined up, these beacons bear a course of 192º T and show the approach channel to the harbour. HW Spring tides give an average 2.5m depth in the approach channel and at the visitors’ pontoons, but this may increase depending on weather conditions. The Neap high tide depth is 1.8m.The harbour dries out at LW, around 5 hours after HW, revealing a firm level bottom. Newport Harbour has basic showers and toilets, water & electricity waste facilities, slipways and winter dry berth storage. It also offers a quay crane that can lift boats up to 7 metres vessel that are under 3 tons. Contact: Newport Harbour Office, Town Quay, Newport, PO30 2ED. Tel: 01983 525994. www.iwight.com. Please note, this information is to be used as a guide only and not for navigation.